(Oregon Coast) - Every year, November means the beginning of the holidays on the Oregon coast - and the start of that cozy, warm feeling and sense of Americana that only this region can provide. From Coos Bay to Astoria, the lights begin twinkling on the trees and in the eyes of those traveling to the beach. And then there are those 'secret celebrations' - those hidden gems no one seems to know about, but are unforgettable and charming. The city of Cannon Beach launches that warm, fuzzy Christmas spirit early, starting its renowned Haystack Holidays in late November. One highlight: come to the Cannon Beach Chamber Community Hall, at 2nd and Spruce, to engage in a bit of Wreath Making, in preparation for your festivities. 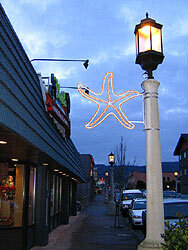 Then, in the first few days of December, at 4 p.m., there's the lamp lighting ceremony at Sandpiper Square. You'll find carolers from the Coaster Theater's production singing traditional favorites, children's choirs and local musicians. To the delight of tourists and locals alike, the city hires members of the Portland Opera to entertain on the streets as well. Seaside will host its Annual Christmas Gift Fair at the Seaside Convention Center every year, usually the last few days of November. Only handcrafted items fill this monster of a gift fair. $2. Seaside Convention Center. 415 First Ave. 800-444-6740. Lincoln City features a stocking full of glittering events. There's the Lincoln City Chamber Holiday Showcase, presented by the chamber in late November, (541-994-3070). Early in December, the Chinook Winds Casino Resort features the Angel's Anonymous Tree viewing, and the Ice Carving Competition, while the Angel's Anonymous Ball happens there as well. At the north end of Lincoln City. 888-CHINOOK. See www.oregoncoast.org for more. In Newport, the Oregon Coast History Center oozes holiday warmth (and yummy aromas) with the festive Holiday Heritage Cooking, usually around the middle of November. This fun event often features local chefs cooking up a storm. Visitors can taste the results too. 545 SW Ninth St., Newport. (541) 265-7509. 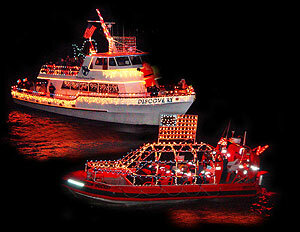 Depoe Bay begins to get lit up with its huge Christmas lighting ceremony the last Saturday in November. The whole town gets together, sings carols and gets full of frivolity as they fire up the Christmas lights. 877-485-8348. At The Mill Casino in Coos Bay, holiday dinners, the "Festival of Trees," and holiday lights begin to take over the hotel and casino. Enjoy a Thanksgiving or Christmas buffet at the Saw Blade Buffet. 800-953-4800. There are a surprising amount of holiday secrets on the coast – festivities most people just don’t seem to know about. In Newport - the town with two lighthouses - the town gets gussied up in a variety of ways, especially on the historic Bayfront. In the Nye Beach area, you can celebrate with more than a little finery at the stunning, bistro-style eatery Village Market & Deli. The Village goes into overdrive with its legendary cuisine, offering special holiday dishes to its partial ocean view, sometimes to the shimmering sounds of guest musicians. This pleasure, and the owners' sister business, Blu Cork Wine Bar, are one of Newport's hush-hush holiday knockouts. Blu Cork will feature a stunning sourdough bread pudding and chocolate cake for the season that contains a multitude of taste layers, as well as specialty holiday meats, spreads, terrines, pates and champagne - all surrounded by its famous wine-themed décor and selection of memorable northwest wines. (541-574-9393 for Village Market & Deli). Other celebrations at Blu Cork Wine Bar include a steady roster of live music and wine tasting events throughout the season. Plus, keep an eye out for their usual New Years Eve blast, which always causes a stir. 613 SW Third Street, Newport. 541-265-2257. This year, Newport hosts the mother of all New Years Eve parties, stretching over four days, from December 29 – January 1, with the Jazz for the Holidays festival. This event is anticipated to be a regular one. It features dozens of musicians and singers over the four days, climaxing with gigs by Nancy King and Bobby Torres on New Year’s Eve and on New Year’s Day. www.jazzatnewport.org. For something different on Thanksgiving, stay in a castle on Oregon's coast and enjoy a truly unique feast.Arch Cape House is a stunning beauty built to look somewhere between a medieval structure and a Swiss ski lodge, and it's a perfect place to get all cozy for the holidays. Every morning means gourmet breakfasts made by the able hand of owner Barbara Dau. On Thanksgiving, Dau's talents will create a special traditional dinner with her artistic flair. It's open to in-house guests only, and cost is $65, including fine wines as well. The highlight here, aside from the food and wondrous surroundings, is the engaging, convivial atmosphere created by gathering to dine with others you haven't met before. This, and Arch Cape's special New Year's Eve traditions, are becoming an increasingly popular addiction for Oregon and Washington residents. On New Year's Eve, Dau puts together a six-course gourmet bash, which features dishes from around the world and matching wines for each. It's a culinary and wine-tasting trip across the globe. It all ends with champagne by a beach bonfire. www.archcapehouse.com. 800-436-2848.